Best storage facility I've used! I've used several storage facilities in Little Rock over the years. This place is the best...clean, conveniently located, reasonable rates, convenient after-hours access and a really nice staff. I usually had to access alone at night but I always felt safe...good lighting plus music playing inside the building helps chase away that apprehension I usually get in an isolated place. If I ever need a storage unit again, this will be the place! Today I had the pleasure of speaking with Mitch at Modern Storage. He was very professional, friendly, answered all of my questions and signed me up for my unit over the phone. Very quick service! I love modern storage unit. They welcome you with a smile, They are here for you when you need any help. They price are great, They can help you find the right unit for you. This place rocks! From the moment you walk in you feel like your in a high-class resort. Employees are extremely courteous and helpful. The facility itself is spotless and very secure. Would highly recommend it to anyone looking for a place. Addison and Matthew were both courteous and professonial. Addison and Matthew were both attentive and courteous, readily resolving any issues questions or concerns encountered. I am confident that my belongings will be safe with Modern Storage. I appreciate the cleanliness, surveillance cameras especially the various angles which reinforced the fact that I had made the right choice in storage facilities. Thanks again for being pleasant and cordial. You have two special team members in Addison and Matthew. They are taking you places one customer at a time. Mitch provided great customer service. He was friendly and helpful. Also, I like that I get to use their truck for FREE when I move in. Staff very friendly and helpful. Great location with easy access. The staff was friendly and very helpful. The prices were very reasonable. I really liked that they have a truck to use for free. Great place! Staff was very friendly and made recommendations that were very helpful. Like that we have use of their truck for free when we move in. They are in a convenient location for our purposes. I had to move in a hurry. I contacted Modern Storage and they gave me a great price for a big space! They also allowed me to use their moving truck free of charge for a few hours and that was a great bonus that helped me tremendously! The customer service was excellent and very professional. Mitch was great to work with. This is a great storage facility and seems very safe and secure! I would definitely recommend this storage facility! Great customer service and affordable! Matthew was awesome! He explained everything in great detail, was very nice, and professional. Top of the line storage facility! Everything about Modern Storage was impressive, from the friendly staff, free moving truck, and clean units! This facility was wonder to work with from the very beginning. They portrayed the epitome of what customer service should be. They (specifically Mitch and Addison) were more than helpful; offering more than one solution for our unique situation. I highly recommend Modern Storage for your storing needs. The office staff are knowledgeable and helpful. Customer Service is a big plus! Free truck to borrow to move my stuff into storage! Can’t beat that! Nice facility and an awesome staff! Matthew at the front desk was very informative, helpful, and very kind. He was a lot of help and was very pleased with his service. First time renting storage , in love with the place . really clean. Front desk clerk Mitch were very helpful and friendly. Great place! Great Location! Great experience! This place is amazing! Super clean, brand new, staff is very nice and helpful, great location, and many options for units! This facality has very friendly staff, easy to work with and most importantly I trust this location to store my items due to the lack of room at my apartment. I will continue to use this storage facality. This storage facility is one of the best that I have used. Very clean and convenient. I would diffidently recomand this storage to friends and family. Extremely nice facility with very helpful staff. I highly recommend Modern Storage. I rented a 5x10 unit but before the day of moveon my situation changed and I suddenly needed a 10x10. The swapped me over the phone and I was able to run by after work to sign papers. The free truck rental on moveon day is quite nice to boot. We are relocating from Las Vegas to Little Rock and this facility provided everything we needed. Mitch is very helpful, and has relieved a lot of my stress as he has gone beyond what was expected to assure we are satisfied...we are So pleased that we found this location. I wish this place was built a long time ago. State of the art excellence in security and service. I will let everyone know about this facility for storage needs. From the moment I walked in I was already Impressed. The people there were really helpful, very nice and excellent service. I will definitely recommend this place to family and friends!!! 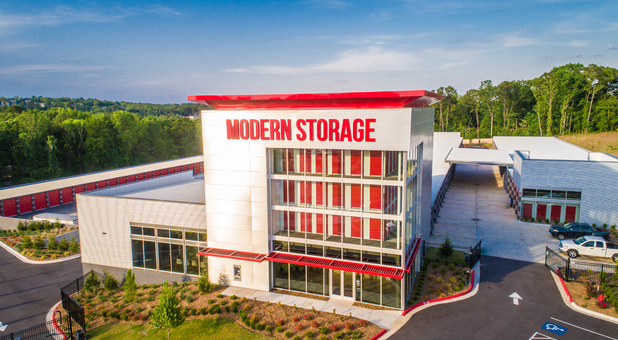 Shana with modern storage is awesome, I give her a 5-star rating...her customer service is fantastic, if you are looking for a clean safe environment go to modern storage. Modern Storage is amazing. It is the best storage facility by far. And the staff is so friendly, OMG I love that place. I didn't want to leave. I will recommend Modern Storage to all my friends, relatives, and co-workers. I highly recommend Modern Storage. Mitch and the rest of the staff were extremely helpful with finding the right size unit and explaining the security features. I had looked at several storage companies in town, and I found Modern Storage to be very reasonably priced, clean and easy to access. I would highly recommend them! Great place and easy to access! Very impressed with this facility and pricing is very reasonable....especially for customers who live close. Very helpful and friendly staff. Having a bob truck available free to new customers is very cool! I would definitely recommend this facility to a friend. They are reasonably priced and the staff friendly and knowledgeable. Bonus....they will let you borrow their truck. Pretty awesome! Great spot to park your boat or store anything. This place is over the top, super clean and very secure. The young man that helped me was very knowledgeable and friendly. This place is amazing. Great customer service. Wow! This place is incredible! I am sure that my valuables will be safe at this location. Matthew was very helpful, even showed us several options before we chose a size. They even gave me a warm chocolate chip cookie. Prices are in line with other storage locations. Beautiful facility, great management /staff and excellent customer service. I would highly recommend Modern Storage.